This type of boundary survey is performed in conjunction with construction of a new building. It shows the location of the new slab or stem walls as they relate to the boundary. This survey is generally required by the lending institution to verify proper placement of the building before construction continues. Rapid Surveying understands the importance of the projects scheduled time line. We like to have prior notice of requirements; such as (certifications, construction schedule, etc.). We will provide you or your lender the completed survey in a timely manner. To expedite your survey it is beneficial that Rapid Surveying does the original building stake out. 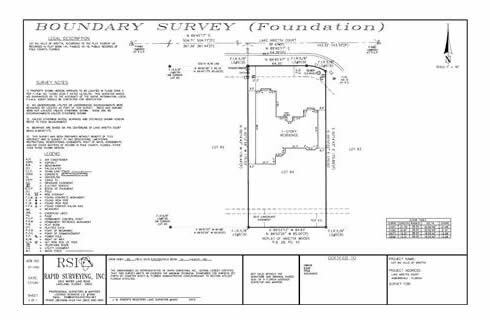 We will have field work completed that verifies boundary and have drawing started so we can produce foundation survey A.S.A.P.